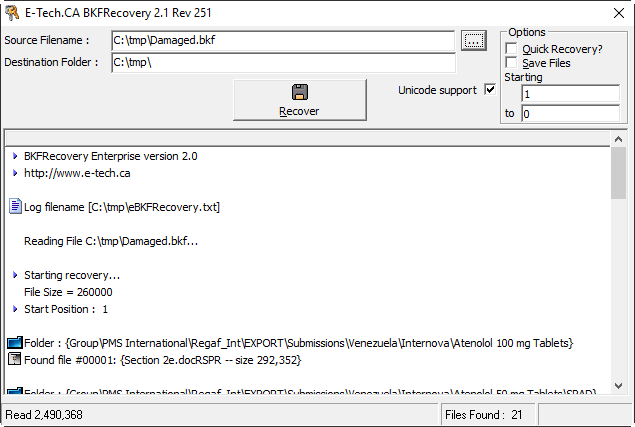 BKFRecovery uses advanced recovery techniques to recover data from corrupted BKF files. 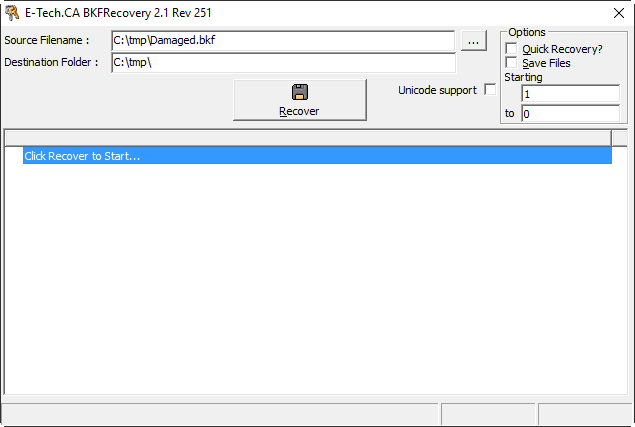 BKFRecovery was the first recovery software ever created for recovering damaged/corupt BKF files. Most recovery service providers use BKFRecovery. (Buy from us direct for big savings!). To recover multiple BKF files in batch mode, download the BKFCLI utility by clicking here. We are designing a custom version for Veritas Storage Migrator (email us for details). Please click the link below to download the trial version of BKFRecovery. We disclaim all warranties as to this software, whether expressed or implied, including without limitation any implied warranties of merchantability, fitness for a particular purpose, functionality or data integrity or protection. Although this software has been thoroughly tested, you are cautioned to backup your data before using this software. "The backup file is unusable"
[Unrecognized Media]. The backup file is unusable. You must erase it, or choose another file. [Insert media] The fixed media is full. You cannot back up all of the specified data to this disk device. The backup operation will stop. [Unrecognized Media]. The backup file contains unrecognized data and cannot be used. [Backup Utility]. An inconsistency was encountered on the requested media. Microsoft Access can't open or convert this previous version database. @The database was created in an earlier version of Microsoft Access. You don't have appropriate security permissions to open or convert databases created in earlier versions. This database is in an unexpected state; Microsoft Access can't open it. @This database has been converted from a prior version of Microsoft Access by using the DAO CompactDatabase method instead of the Convert Database command on the Tools menu (Database Utilities submenu). This has left the database in a partially converted state.If you have a copy of the database in its original format, use the Convert Database command on the Tools menu (Database Utilities submenu) to convert it. If the original database is no longer available, create a new database and import your tables and queries to preserve your data. Your other database objects can't be recovered. I'm happy to let you know that 150GB of .bkf file was successfully recovered in 22 hrs and 45 min. We are out of the woods now. It was a tight spot, let me tell you. One particular job had 67GB worth of data. One shudders at the prospect, now extinct, of rebuilding it from copy and photographs. The price of the program is totally in line with its worth to us.